Esther was full of charisma. The bright, bubbly six-year-old saw the joy in every situation. But Esther suffered with a windswept leg caused by rickets—a brittle bone condition that causes leg deformities. When children don’t get the nutrients they need at key stages of their growth, they can develop rickets. 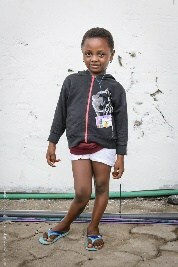 When Esther was only 18 months old, her leg was already growing the wrong way. 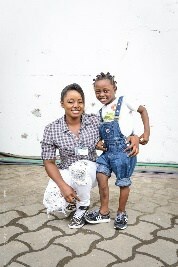 Her mother, Mabel, was a single parent who tried to find a way to fix her vibrant little girl’s twisted leg. She was told that nothing could be done and that it was too late. As Esther grew up, she was treated differently due to her windswept leg, and her mother sadly watched as her little girl slowly became more reclusive. Esther’s true personality only emerged at home in the safe presence of those she knew wouldn’t tease her. The rest of her days were spent watching from the sidelines as her confidence faded. After she started school and the teasing increased, her energy and love for life diminished. The Esther that Mabel knew was disappearing before her eyes—scared of the unknown and unable to continue school. aring about Mercy Ships through a friend, they made yet another journey to the port city—but this time it wasn’t a dead end. Esther was accepted for orthopaedic surgery to correct her windswept leg. 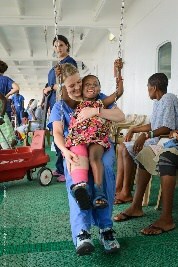 Time onboard the Africa Mercy saw Esther’s personality emerge like a butterfly from a cocoon. It didn’t take long for the crew to fall in love with her true personality. She thrived in the comfort of a loving and accepting environment, as evidenced by her endless giggles and smiles. Esther’s pink cast and brightly coloured hair bands lit up the rehabilitation tent during weekly physical therapy sessions. As her bones grew stronger, so did her confidence, revealing the bold, beautiful daughter Mabel always knew was there.